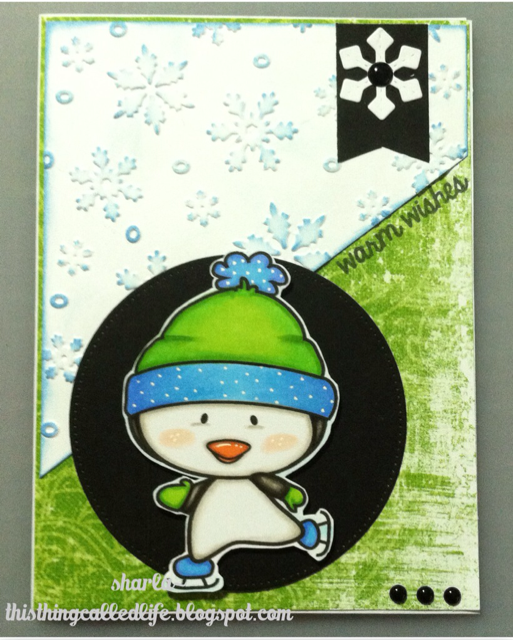 I finally got this cute little guy on a card, he's been colored up for a few weeks, and I found a cute sketch over at From the Heart Stamps, I used a new embossing folder from Darice-snowflakes, I lightly ran my ink pad across the top to make the snowflakes stand out and inked the edges as well. The black stitched circle is a die from My Favorite Things, the sentiment is from Some Odd Girl, the snowflake die is from Lawn Fawn and the enamel dots are gumdrops from Your Next Stamp. Oh he is adorable Sharla. Love that little guy. Happy New Year! Awww he is so cute. I like that you added ink to make the embossing pop. Of course I love your colouring…how did you enjoy the colouring class you took a few months ago…I think it was a few months ago?